Gokyo Ri Trekking is popular trekking trail in Everest region. It offers an Excellent views of Everest Himalayan range with small lodges on the entire route and usually less crowded than the base camp trekking and alternative to the traditional trek to Everest base camp. From Gokyo Ri more of Everest itself is visible, though from a slightly greater distance, than from kala pattar above gorak Shep. The view from Gokyo is exceptionally beautiful and offers more of the legendary mountain than from the views from Kalapattar though from a slightly greater distance. Day04- Trek to Namche Bazaar (3480 meters) 5 hours. Day05- Namche Bazaar Acclimatization day. Day06- Trek to Dole ( 4130 meters) 5 hours. Day08- Trek to Gokyo (4770 meters) 4 hours. Day09- Hike up to Gokyo Ri (5360 meters) early in the morning then Back to Gokyo 4 hours. Departure date and itinerary arrangements can be tailored to your requirement, Tour cost will be Up down as per your service requirement, so please contact us for your queries regarding your Gokyo Valley Trekking Departure Date, Tour cost, itinerary, Service requirement and other any queries regarding your holiday in Nepal, Tibet, India and Bhutan. Day01- Arrival in Kathmandu airport (1345meters). Our representative will receive you at the airport and lead you to the hotel. Take some rest at the hotel and then our staff will brief you about the trip. They will provide you short information about the tour and preparation for tomorrow’s sightseeing. After briefing, you can visit to the local areas and buy some personal packing for your overall trip else take rest at the hotel. Enjoy your overnight stay at hotel with fine Nepali dinner. Day02- Pre-trip Meeting and Sightseeing around Kathmandu valley. After breakfast, we host a pre-trip meeting at the same hotel and introduce you to our professional tour leader for your further trip. He will brief you about your overall trek. You get an opportunity to ask your questions about your trip. Clear your confusion without any hesitation. And also be sure that you have your document fulfilled. Then, after briefing, our tour leader will lead you to your today’s trip places according to the schedule. Here we visit one of the biggest Buddhist shrines in the world- Boudhanath Stupa, the famous Hindu temple in the country that is located in the bank of the holy Bagmati river- Pashupatinath Temple and the temple known as “monkey temple”- Swayambhunath. .After main entrance at Pashupatinath, you can see the Hindu holy men (sadhu) who are particularly famous for this area. In Swayambhunath, we can observe Buddhist monks praying in the monasteries surrounding the Stupa. We will also visit another the most attractive religious place of our country- Bhaktapur Durbar Square which has the main reason to be attractive like: The Lion Gate, The Golden Gate, The Palace of fifty five windows, its Art galleries and so many. Rest of time, visit the local areas around Thamel. Stay overnight at the hotel in Thamel, Kathmandu. Early in the morning, our private vehicle will drop you to the Tribhuvan International Airport for your flight to Lukla. You will fly for 35 minutes with the view of beautiful Himalayas and natural sceneries. After landing in the Tenzing and Hillary Airport in Lukla, our guide will introduce you our porters before trek to Phakding. Here begins the adventure of trekking. Today you will walk only about 3 hours to Phakding. To reach Phakding, we have to descend towards the Dudh Koshi River which leads to the main trail to Namche Bazaar, located just above Chaunrikharka. It’s easy to walk after passing through the small village of Ghat. Overnight at Guest house in Phakding. We walk along the bank of Dudh Koshi River, cross many exiting suspension bridge to reach Namche Bazaar. On the way to Namche Bazaar, the trail passes along the Sagarmatha National Park which wildly changes into the steeply breathtaking view. As Namche Bazaar is considered as the main gateway to Everest, it has developed into the town with all the luxurious and urban facilities like restaurants, lodges, money exchange services, internet cafe and bakeries and so many. You need to walk 5 hours to reach Namche Bazaar. Tonight stay at the Guesthouse in Namche Bazaar. In order to acclimatize, today you will stay in Namche Bazaar. It’s the place from where we can see the first glance of Everest. From here you can see amazing views of the Himalayas with a stunning sunrise and sunset over the panorama of Khumbu Peaks. You can go for the exploration of local places and experience the their culture. Take overnight rest at Guesthouse in Namche Bazaar. Early in the morning, hike up to Mochermo. You can get clear views of snowy peaks, mountains and vegetations. You can observe their living style and culture. People over here irrigate the crops for their needs and earn their income. Farming and lodging are the main occupation of Dole people. It takes 5 hours to reach Dole from Namche Bazaar. Take overnight rest at Guest house in Dole. Crossing Dole, you will be headed for Mochermo which is the way to Gokyo. On the way to Gokyo, you can get an excellent view of the valleys. It takes about 6 hours to reach Mochermo from Dole. We have to climb the terminal moraine of the Ngozumpz glacier. Ngozumpa Glacier is one of the major places of attraction because of its appearance in the world’s second largest glaciers. Stay overnight at fine Guest house in Mochermo. Your nearest way to the wonderful village Gokyo begins here. At morning, you will be starting trekking towards Gokyo. Gokyo village is our main destination to be reached. You have to trek via Ngozumpa Glacier where the trail selects its zigzagged path. You can take the close views of Mt. Everest, Mt. Lhotse, Mt. Cho Oyu, Mt. Nuptse, Mt. Pumori, Mt. Thamserkum, Mt. Amadablam, Mt. Kusum Khagaru, Mt. Kongde and so many on the way to Gokyo. Gokyo village is situated on the northern shore of Dudh Pokhari which looks amazingly outstanding. Although it is far from the urban city but it doesn’t lack any facilities for its customer. This village is the main attraction of the trek. 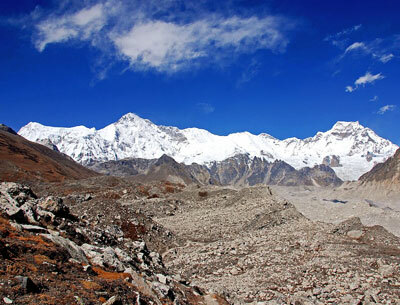 Gokyo valley trekking is an alternative route to traditional trails to the Everest Base Camp. Tonight stay at the Guest house in Gokyo. Today is the day for acclimatization in Gokyo. But if you are interested then you can go for hiking up to Gokyo Ri early in the morning to see the amazing views of Gokyo village. Gokyo Ri is an excellent view point in Everest Region. You have to hike up 4 hours to reach Gokyo Ri. Get the memorable views and descend back to Gokyo. Overnight at Guest House in Gokyo. After the 2 nights stay at Gokyo, we trek back to Dole. Our adventure to Gokyo ends here. The trail passes accross the Ngozumpa Glacier through Dudh Koshi River. On the way to Dole you can get beautiful and close views of Cho Oyu, Tharmserku, Kangtega and many other peaks. We trek down to Machhermo where the trail becomes easy to walk. Overnight at Guest house. After 6 hours trekking, we reach to the beautiful Sherpa village- Namche Bazaar. Sherpa is one of the major castes of Nepal. You are warmly welcomed in the fine Guest house in Namche Bazaar for your night stay. Today morning you will leave Namche Bazaar and trek towards Lukla. You will move your steps being touched with suspension bridge over the Dudh Koshi River and passing the rhododendron forest, snowy mountains and peaks, and the pine forest. You can see the Sherpa people’s lifestyle and their cultures, Gompas and monasteries over here. This is the ending place of your trekking. You will stay here for one night. You can get beautiful natural views on the way to Lukla where you enjoy your 6 hours trekking being touched with nature. Overnight at Guest house. The last day of your trekking ends here. At morning, you will be led to the Tenzing and Hillary Airport, Lukla for your departure and flight to Kathmandu. It will take only 35 minutes to arrive in Tribhuvan International Airport from Lukla. During flight, you can enjoy the amazing views of mountains and Himalayas, valleys, rivers and even the dense forests. After arriving airport, our private vehicle will pick up you from the Tribhuvan International Airport, Kathmandu. Stay at the star ranged hotel in Kathmandu. Today is the last day of your trip in Nepal. Our private vehicle will come to pick you at the Hotel and you will be transferred to the International Airport for your final departure. Kathmandu - Lukla- kathmandu Flight.